ORANGE WALK TOWN, Fri. Feb. 26, 2016–After 4 days of an intense search and recover operation carried out by Orange Walk Police, the Belize Coast Guard, and volunteers to find the body of an unknown man who had jumped into the crocodile-infested waters of the New River near Orange Walk Town on Monday evening and had disappeared, the search was ended today. The operation was halted by the Coast Guard because the search mission was proving to be fruitless. Inspector Nicolas Palomo, Deputy Commander of Orange Walk Police, reported that three days had elapsed without them finding the body. Volunteers and policemen are on a river watch to retrieve the body if and when it floats to the surface. It is strongly believed, however, that the body will not be found because it had been devoured by the crocodiles. Palomo said that no one has made a missing person report to police, so the identity of the man remains unknown. The incident occurred at about 5:30 Monday afternoon, February 22, when two men who were socializing on the riverside of the New River behind the La Immaculada School in Orange Walk Town jumped into the river to take a swim. They were never seen alive again. 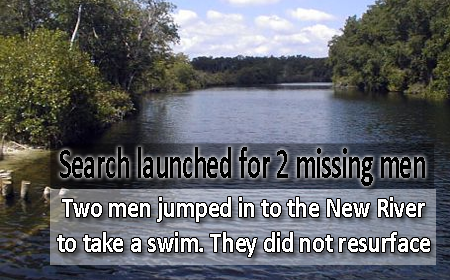 A search was carried out by Orange Walk police, the Coast Guard and volunteers, and at about 11:30 Tuesday morning, over 12 hours after they disappeared, the body of Carlos Reyes, 23, of Trial Farm, was recovered from the New River. A woman who lives in the neighborhood told police, that before she saw the two men socializing by the river, she had seen a crocodile in the area several times that day. She again saw the crocodile when the men were preparing to jump into the river, and warned them that the crocodile was around, but they ignored her and still jumped into the river. Hidalgo Velasquez, the driver of a vehicle who was along with Reyes, was also about to jump into the river after parking the vehicle, but the woman shouted at him and warned him not to go in. Reyes, however, took her warning for a joke, and replied, “I am the crocodile.” Luckily for Velasquez he did not enter the water. Velasquez reported that he waited about 20 minutes and when his two friends did not resurface, he went to the police. Carlos Reyes has since been buried.